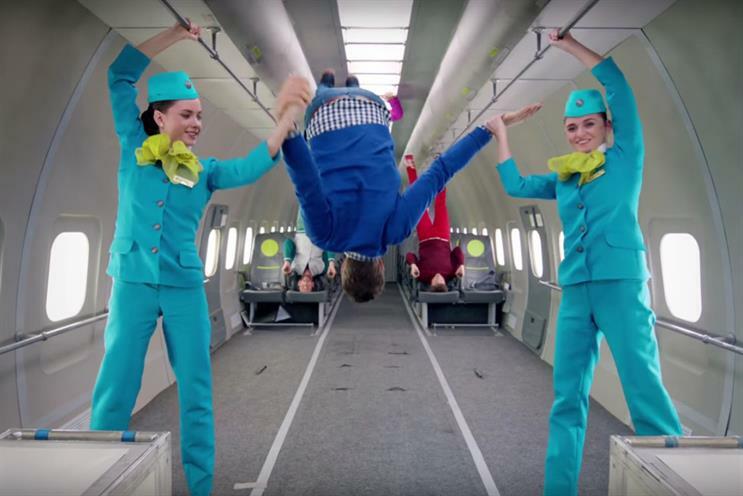 The band teamed up with S7 Airlines, the Russian airline, to film its latest video in a plane. The band filmed the music video in a plane and says it was shot in "zero gravity". They play around with the atmosphere, releasing colourful balls and jumping around. The film has been shared one million times. In a battle between Marvel comic characters, Ant-Man steals a mini can of the soft drink from Hulk and is chased for it, but then Hulk struggles to open it. The ad has been shared 121,547 times this week. A half-baby, half-monkey creature repeating "puppymonkeybaby" hands three men an energy drink and gets them up for a night out. The ad has been shared 42,572 times this week. 4. Coca-Cola "Sebastián Villalobos en el amor"
The vlogger talks about his relationships. The video has been shared 27,277 times this week. Viewers see the making of the car out of a block of metal. The social campaign asks people to tag a friend to be in with a chance of winning a driving experience. It has been shared 19,826 times. 6. Fox Sports "Jeff Gordon police chase"
The reporters follow a car chase that seems to be leading to the Fox studio. When the suspect exits the car outside the studio it turns out to be Jeff Gordon, a new presenter for the channel. He is surrounded by police and explains that he was just on his way to work. A policeman responds saying that all they wanted was a selfie. The ad has been shared 13,826 times this week. Kevin Hart stars in the ad and uses the Car Finder feature of the car to follow his daughter on a date. In the hilarious ad he offers the young couple his car, and then pops up at the cinema and the fairground giving the boy a dirty look every time he makes a move on Hart’s daughter. The as has been shared 12,563 times in the past week. In another Super Bowl ad still in the chart, dogs dressed as hot dogs run towards their owners who are dressed in different Heinz products such as ketchup and mustard. The spot was shared 12,341 times in the past seven days. The rapper Snoop Dogg stars in what the brand calls an internal training video promoting the hot dogs. He tells viewers how they are made in classic Snoop Dogg style. The ad was shared 8,877 times in the past seven days. The mobile phone brand wanted to find out what a piano would like if all the keys were tuned to middle C. A pianist switches between two pianos, one that has been re-engineered, as he plays some music. At the end the copy reads: "Be together. Not the same." The spot was shared 8,466 times in the past week.